Click on any picture for an enlarged version. Hanover, NH, September 1999. Special delivery at the office that day. Side view. Dartmouth-Hitchcock Medical Center. Rear view. DMHC buildings are in the background. Adding some colour courtesy of the 1999 season. Looks much more at home with dirt on the tires. 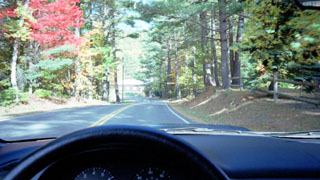 Heigh Ho... Driving to work on a glorious fall day. 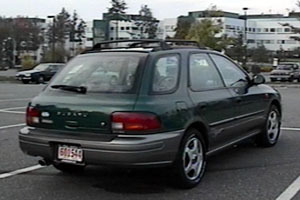 It's a "pre-owned" Acadia Green Metallic Impreza wagon in the lively Outback Sport trim. Original life was in Connecticut, and it doesn't seem to have seen much salt or dirt. It has a 2.2L "boxer" flat-4 (just like a Porsche, or a Cessna) engine (137 hp), full-time all-wheel drive, roof rack, monstrous hood scoop and hood vents, cassette and CD player, cruise control, 4-channel ABS, A/C, and dual air bags. 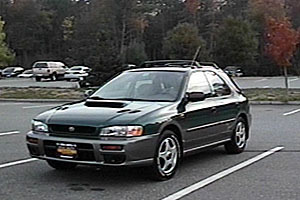 The holes in the hood are for show only, but many Impreza RS owners have opened them up for custom intakes and turbo intercoolers. Recent additions to the car include cruise control, factory fog lamps, leather-wrapped gearshift knob, leather shift boot, and leather-wrapped steering wheel. No sunroof, since there's a luggage rack. No alloy wheels yet, hope to get them by spring. The car has excessive understeer on snow. It really has to be forced into oversteer mode through a tricky combination of getting enough grip to start the nose turning, followed by plenty of throttle to kick the rear end loose. Otherwise the car will continue to plow forward using grip from the rear wheels. Once the rear end is broken loose, donuts and 4-wheel drifts can be quite fun. This understeer also limits the ability of the car to do 180-spins easily. Watch a video clip (835K AVI) of a wagon doing a slo-mo 360 in the snow! Or watch the entire video (2.3M MPEG1) of several slo-mo donuts in the snow. Note: you might need to use the right-click, Save As... procedure to save them to your local hard disk first. Then play them using any media player that supports AVI (Indeo 4.4) and MPEG. 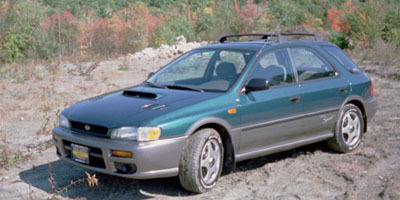 Click here and look in the Downloads section to see video of an Impreza doing donuts! Click here and look in the Gallery section to see more action pictures and video. Click here to see Motorweek's special on two awesome Imprezas. One is a Japanese market-only 22B supercar. 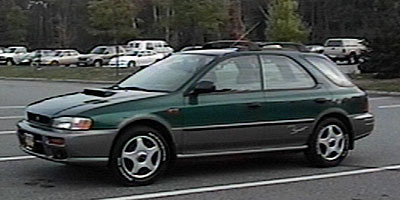 The other is a custom 2.5RX turbo, based on the North American 2.5RS. In my quest to bring a little refinement to my car, I've documented some of the modifications and improvements I've made. How-to page describing replacement of the stock rubber shift knob and rubber shift boot with a leather shift knob and leather shift boot. How-to page describing installation of a jet fighter-style digital Heads-Up Display (HUD). Okay, not really, but it's actually very functional. How-to page describing the installation of a factory cruise control kit. How-to page describing installation of a roof rack fairing. I've found a configuration that bolts directly to the factory roof rack bar. Perfect when there's no aftermarket rack bars to fit matching fairings to. This i Club Webring site owned by Wayne Chin.